Many people ask me, “Why waterfowl hunting?” My answer often includes references to the camaraderie, variety of locations to hunt, different species, and different strategies that are all part of waterfowl hunting. Alaska is famous for its abundance of big game species, but its variety of small game, and waterfowl in particular, is often overlooked. Hunters can choose from 22 duck species, four goose species, brant, tundra swans, common snipe, and sandhill cranes. The hunting possibilities are endless with each species providing a different challenge and a shot at non-stop action. To begin planning your waterfowl hunt, the first question that you’ll need to ask is, what species am I after? The answer will help you determine where in Alaska you’ll be heading. If you like jump-shooting birds (locating resting or feeding ducks or geese and stalking into effective shooting range) then consider a trip to Southcentral Alaska. Many areas here are road accessible and open to the public. Places like the Palmer Hay Flats State Game Refuge , the Anchorage Coastal Wildlife Refuge, the Susitna Flats State Game Refuge, and the Copper River Delta contain river systems with backwaters, sloughs, and marshy areas that provide good jump shooting as well as opportunities to set-up decoy spreads. Many waterfowl hunters enjoy taking a boat out on the Susitna River to check out sloughs and backwaters or run a canoe down Rabbit Slough to the Palmer Hay Flats. To hunt the Anchorage Coastal Wildlife Refuge you must complete a certified hunter education course. Southcentral is a great location for shooting puddle ducks (typically freshwater birds found in shallow marshes and rivers that feed by dabbling or tipping rather than submerging) and diving ducks (these species frequent larger, deeper lakes and rivers, and coastal bays and inlets; they feed by diving, often to considerable depths). Species commonly encountered are: mallards, northern pintail, scaup, teal, American widgeon, and northern shovelers. General waterfowl hunting seasons in Southcentral open on September 1, so many ducks remain in eclipse plumage (less colorful) which can make identification more difficult. A great publication to help with duck identification is “Ducks at a Distance” which can be obtained at your local ADFG office or Ducks Unlimited offers a mobile app that includes photos, audio sounds, descriptions, and additional information about popular North American waterfowl species. While packing gear, remember that the weather is variable, so it could be cold and rainy or so warm out that your neoprene waders leave you soaked in sweat. Interior Alaska provides opportunities to hunt geese, cranes, and ducks. Near Delta Junction hunters can settle into ground blinds for an exciting day of hunting geese and cranes over grain fields. Check with local landowners for permission to access their property. Canada and white-fronted geese (often called specklebellies) are abundant. Spending time at the range with your shotgun practicing crossing shots and fine-tuning your goose call is a must. Thousands of sandhill cranes spend the summer around the Fairbanks area before migrating south and camouflaging your spread to attract this wary bird can provide an additional challenge. The Tanana River Valley and the Minto Flats State Game Refuge produce thousands of ducks and great hunting opportunities before colder weather pushes ducks south. The Mendenhall Wetlands State Game Refuge is a popular spot to hunt waterfowl in Juneau. The intertidal habitat provides abundant seeds of sedges, grasses, and other plants for waterfowl species to feed on. The Canada goose population is abundant year-round in the Juneau area and in the open waters of the Gastineau Channel and Fritz Cove hunters can find goldeneyes, buffleheads, scoters, and mergansers. Each autumn thousands of sandhill cranes and snow geese migrate through the Stikine River Delta near Wrangell. The Forest Service has public use cabins available for hunters to rent. 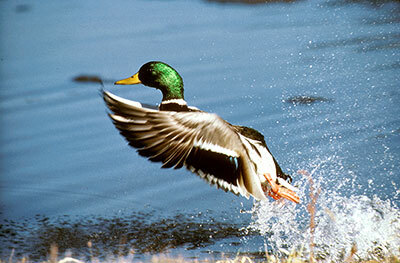 Due to its abundant coastline, Alaska is a mecca for waterfowl hunters looking to harvest sea ducks. Sea ducks are marine-dwelling diving birds that breed primarily in the higher latitudes of Canada and Alaska. They have specialized bills to eat mollusks and crustaceans from the ocean floor and to catch fish. Hunters often target sea ducks due to their colorful breeding plumage. 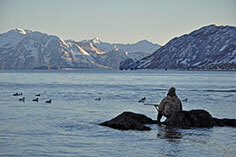 Popular locations to hunt sea ducks include Prince William Sound, Kachemak Bay, and Kodiak Island as well as many locations in southeast Alaska. The coastal areas can provide opportunities to hunt from rocky shorelines over lines of decoys or from a layout boat. Many hunters choose to hunt with a waterfowl guide that already has the specialized equipment (ocean vessels, layout boats, decoy lines) and knowledge of the tides and area. For a list of registered waterfowl guides, visit the ADFG website. Cold Bay and the Izembek State Game Refuge draw waterfowl hunters to this remote area due to one of the largest eelgrass beds in the world. These eelgrass beds support millions of waterfowl, including black brant and cackling Canada geese. A multitude of sea duck species also remain throughout the winter in the ice-free waters of the lagoon. Hunting in western Alaska isn’t for the faint of heart though since you’ll typically be fighting wind, rain, fog, and cold temperatures in order to harvest these coveted species. As you consider your fall hunting plans, don’t forget about the waterfowl hunting opportunities in Alaska. You could plan a weekend of waterfowl hunting in-between caribou and moose season or chase sea ducks well into December or even January in southwestern Alaska. To prepare, make sure and purchase a Federal migratory bird hunting stamp and an Alaska waterfowl conservation stamp along with your hunting license, and remember to check the waterfowl hunting regulations. 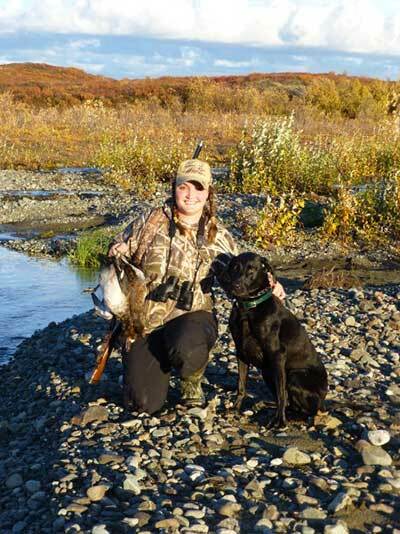 For additional information and resources, visit the ADFG Waterfowl Hunting in Alaska webpage. Ginamaria Smith is the coordinator of the Hunter Information and Training Program at the Alaska Department of Fish & Game. She’s based in Anchorage.